I had a wonderful weekend at Yarnover and at StephenBe, if a little exhausting, but really, if that’s how work is going to be? I can think of lots of exhausting jobs I could be doing that wouldn’t be any fun – so I’ll take it, and happily so. Something shocking happened though – I took no pictures. Wait, that’s not true. As I look though my phone, I can see that apparently, I took three. 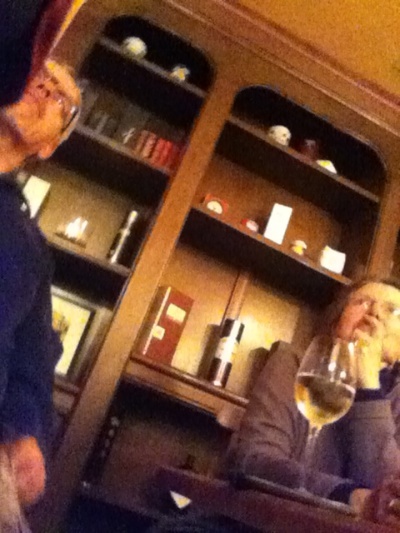 This one, which is an absolutely horrific shot of Carson Demers, Nancy Bush and what appears to be Carson’s glass of Chardonnay. A shot I took on Sunday night when I snuck behind Stephen Be right before I took the stage at the conclusion of Fiber Fest. I swear, I thought it would be better. It was great – and I’m sorry I only took a picture of Carson’s wine. I’ll try harder next time. Were you there? Were you somewhere else? Get any good pictures? Before I go off and do that though, I want to tell you about the conversation I had at the customs desk on the way into the airport. There was a long line (customs here is run by the US government, and is effected by the furlough/ sequestration thing) so when I finally got up to the harried US Customs Officer, he looked like he’d really had enough of his day. "Why are you going to Minneapolis?" he barked. "I’m going to a knitting conference." I explain, smiling brightly. This is usually the point where they don’t ask me any more questions. They don’t want to talk about knitting. They don’t want to hear about how interesting knitting is. I say I’m going to a knitting thing, then they shrug in this "it takes all kinds" sort of way, and wave me into the country. Not today. "A knitting conference?" he glares at me. "Yup." I say. Smiling even more brightly. He’s armed. I want him to be having a good day, and to like me. "That’s over." He says this to me like this is absolutely true, and cannot be argued with. I wonder for a minute what he knows, or what he thinks he knows, and I take a stab. "No" he says, the hand holding the stamp over my passport just hovering there, like maybe he’s not going to stamp it, and maybe I’m not going to go to the knitting conference he thinks doesn’t exist. "It was last week, or maybe the week before, and definitely not in Minneapolis. A lady went through here. She was going. I think you missed it." "Oh!" I say this fairly confidently. "You’re totally right. There was a knitting conference a few weeks ago. Stitches – in Atlanta. That’s what you’re thinking of." "No." he replies, becoming quite terse. "It was NOT in ATLANTA, and it is absolutely over by now." "Okay" I say, wondering if I’m going to be allowed to go to the US if I can’t figure this out. "There was another one. Vogue Knitting, in Seattle? That was in early April?" He looks at me like I am starting to make sense. My hopes soar. "YES." He exclaims, and as punctuation, he stamps my passport. "It WAS SEATTLE!" We are both relieved to have worked this out. I can tell. He continues "Any way you slice it, I’m pretty sure you missed it." "It’s okay" I say, trying to sound reassuring. "There’s another one. In Minneapolis." "Three in a month?" he says, making it clear that this is not possible, and then he realizes that we’re talking about knitting. "Just go." He says, and with that, he gave me a look that said that he hoped I had fun at the knitting conference that was over and I was totally not going to, and turned to the next person in line. I can’t tell you how much I hope they’re going to Unwind. 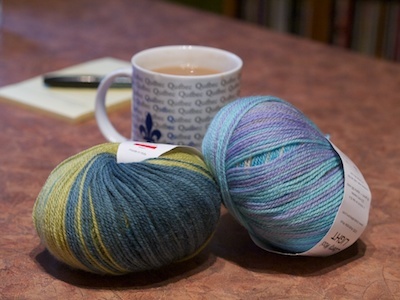 I don’t know if my brain is like this because I am a knitter, or if I am a knitter because my brain is like this, but I have always been the sort of person who finds it easier to work things out when they are live and in person, right in my hands. This makes working on the computer my least favourite way to try and sort out something that needs to be seen holistically – as a whole thing. If I’m working on a fussy knitted thing that has multiple charts, the first thing I do is print them all out and put them down – taping them in the order they will appear as a knitted item. I might end up working from the charts in the book or the pattern, but I have the sort of mind that’s just going to make fewer mistakes if I can grasp the big picture before launching. Scissors, tape, a black marker, a pen. 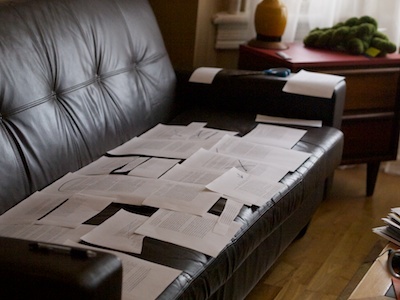 I print what I’ve got, then start working through it, reading out loud, crossing things out.. adding things, making notes. When I find something that should be cut – I literally cut it out. When I find a bit that belongs somewhere else, I cut it out and put it where it should be. It lets me see the whole thing at once – and it lets me gauge the length, literally in metres. When I’m done, I make virtual changes in the document, then print it out and start again. (What you see here is a second pass. The third will be way less brutal.) 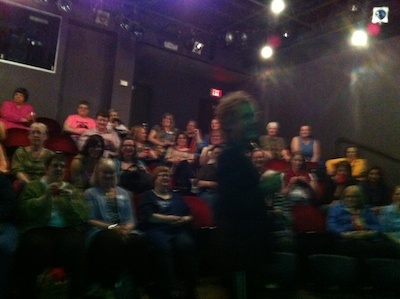 When I think it’s done – I stand up, in my proper shoes and read it aloud, just as I’ll perform it for all of you. I time it too… to make sure it’s not so long people will run out of knitting or won’t need a second mortgage to pay the babysitter. It works for me, though I wondered how unique this system was. Earlier today – thinking just that, I sent the picture to a some friends. I wondered if anyone else needed scissors and a fixative to get through editing? Our Lady Rams of the Comments (who is a real person, who exists outside of the comments as well) responded with the most clever answer ever. "Sit down. Drink your coffee while I explain that "cut and paste" is a word processing metaphor." I laughed for an hour. Yeah. I guess I’m not the only one using the system. Speaking of a system, see the green yarn on the table? 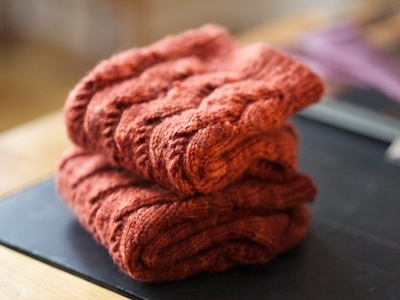 It’s IndigoDragonfly Ultra MCN in regeneration – and knitting it into Afterlight is going to be my reward. You know. When I get this all taped together. Whew, here’s a week moving at breakneck pace, although I had a wonderful reprieve this morning. I woke up thinking it was Thursday, and just about wept considering how great it would be to have another day, just to make things tidy and beautiful. When I sat at my desk with my coffee and checked my calendar it was like receiving the most amazing gift to realize it was only Wednesday. It being Wednesday does also explain why there isn’t a little more done on my current socks. I was sure there was an Angel themed pair of socks out there, and it looks like I was wrong, but there was a pair called Staked, named for the parent series, Buffy the Vampire Slayer . Sam thought this was perfect. (I am less clear on the connection, but I’m faking it. I can admit that Angel seems to be a very nice Vampire, and he does whine marginally less that I remember Buffy doing.) 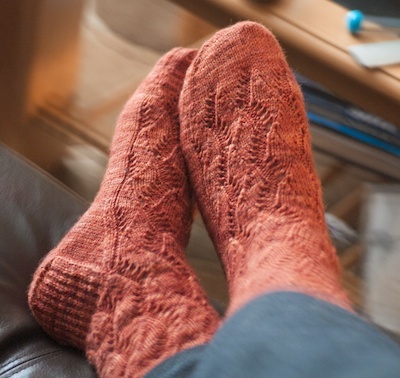 I’m using Bertha, and I like it a lot, though really, what’s not to like about any combo of Merino, cashmere and nylon for socks. Soft, strong and pretty. 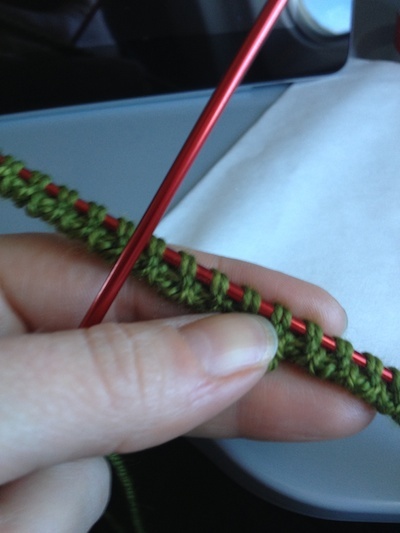 I haven’t decided yet if they’re my plane knitting for this weekend when I hit the road again – the combination of charts and twisted stitches and keeping track of things doesn’t make them the best travel knitting, but I might give it a shot. A special mention of Sunday night, I’m doing a talk for FiberFest, and it’s a new one – I think it’s going to be great, but right now the thought of it is giving me cramps. I’m going to pour that anxiety into practicing. 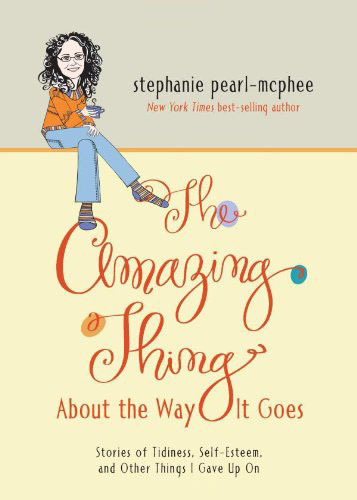 Also, it’s totally possible I had a little falling down in the yarn department – and it’s totally possible that it’s arriving this afternoon, and it’s totally possible that it will be hard to resist. It’s really possible that I might not even try to resist, because deciding to give in is so much easier than accepting failure. I wonder how long I’ll be a knitter when I truly develop yarn resistance? 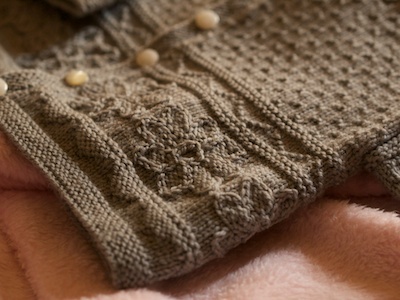 There are a lot of things I love about knitting. The list is long and complicated and you all know most of them, or you wouldn’t knit the way you do- which I’m assuming is rather a lot. I suppose I hope it’s rather a lot, so I’m not so odd. I’ve been making a list of ways that I love knitting, ways that it keeps my life straight and gives me gifts that I’m grateful for. The housework, my fundraising goals, my fitness level, eating only whole foods… Unfinished. I’m working on all of it, but there’s no way I’ll ever be a finished person, or have a life that needs no work. 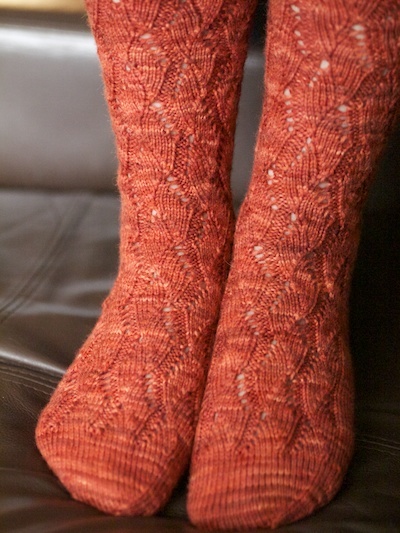 Waving Lace socks from Favorite Socks . Yarn: lost the label a long time ago. That said, these socks? FINISHED. Completely DONE. They are something I started and ended and they are whole, and they don’t need anything more from me. 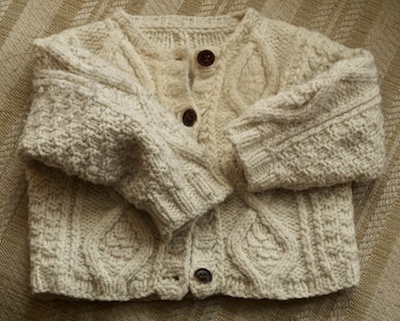 That’s one thing I love about knitting.You can be finished. Socks, anyway. It would appear that my nephew is so sneaky that he grew while I was knitting, which makes me very glad that I noted the number of stitches and the method of concocting down here – because this one? It’s cute and all, but it fits him the way that 15 year old girls like their jeans to fit, which is to say that it’s too small for my taste. I’d be upset, but there’s another baby on the way in this family, and I know Katie will share Luis’ little things, and besides, Lou doesn’t look like the sort of kid who’s going to be an only child. The sweater will get used. 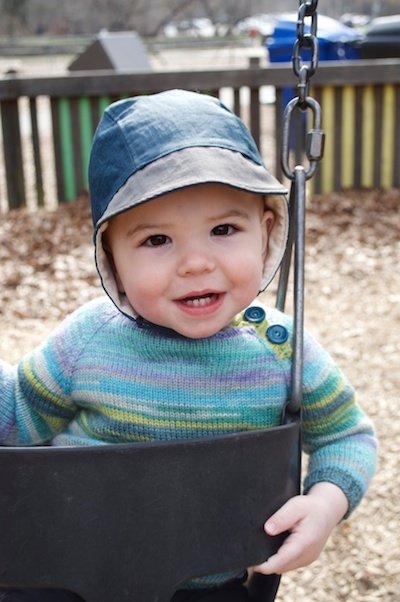 I do wish he’d stop growing quite so fast though – for more reasons than I can tell you. I spent the better part of the day at the hospital with Sam (all’s well – the cast is off, she doesn’t need surgery, and she’s ready to start physio and try to get her arm back) and it’s thrown me dreadfully behind. All you get from me today is finished pictures of Fanasæter. 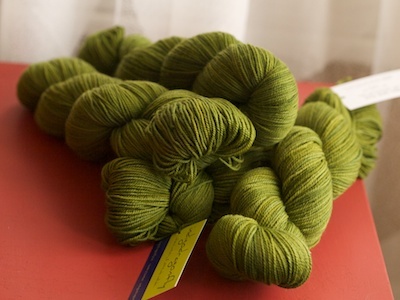 Yarn: SMC Baby Wool – almost exactly six balls. Needles: 2.25mm. I think I’m pretty happy with it, although I’m not sure that it’s as neutral as I thought it would be. I mean, I think it’s neutral, and I think the parents will be happy to put it on either a boy or a girl, but several people have implied that it’s a smidge emasculating for a little guy. I disagree. I like it a lot – and besides, you all know where I stand on the crisis of little boys being taken for little girls and the opposite. I don’t think it matters a bit. I don’t want to say anything about my little sulk for spring working or not, just in case I hex it, but I can tell you this. 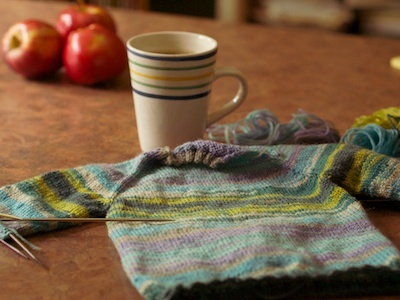 On Friday afternoon I made a cup of tea, gathered my yarn and needles and started a little sweater in spring colours. I went down a needle size, worked a few centimetres of ribbing, and cast off loosely, then returned my attention to the sleeves. I put all the stitches back on the needles, picked up two stitches in the armhole, and started working in the round – cruising down the sleeves, decreasing two stitches every 10 rounds three times, continuing again, until it measured what Luis does from armpit to wrist – plus a little. 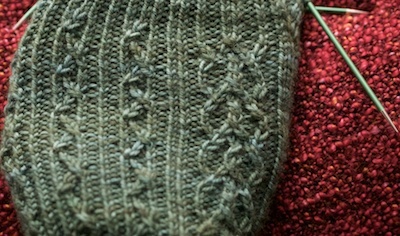 A few centimetres of ribbing, and cast off. 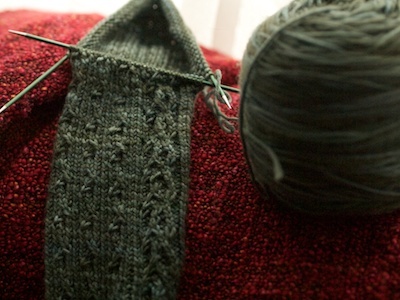 I went back to my little neck part and picked up and knit some stitches for a little placket on the bottom – just a few rows of ribbing… then picked up and knit the same number for the top overlap, and worked that for about 3cm, with two buttonholes smacked right in. Voila! 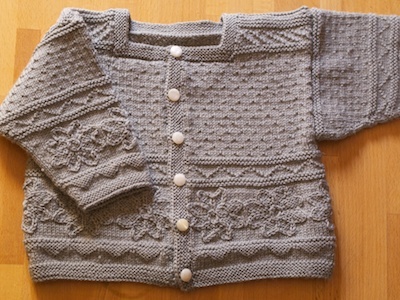 A little sweater, made from two balls of Liberty Wool Light (colour 6606) done in less than a weekend. I wove in all my ends* gave it a little bath, sewed on two vintage buttons from the bin, and today Joe dropped it off for little Lou on his way to work. 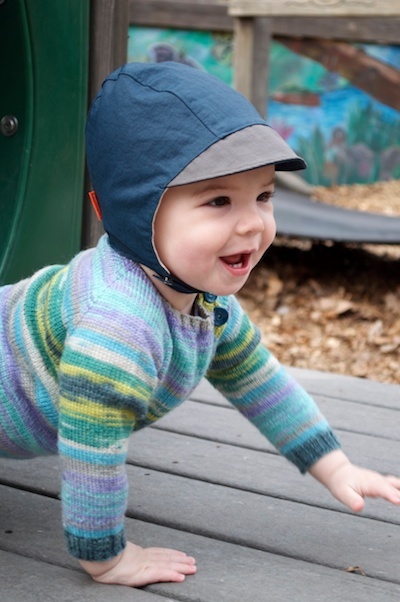 Easy peasy, quick and springlike – and today it’s 10 degrees out. Perfect (almost) spring weather for wearing it. So much fun, I almost made another one. *There were a lot of ends. A whole lot, because while the plan for the sleeves sounds simple and sensible, I’m still me – and I can’t stand it when sleeves don’t match each other, or the body. 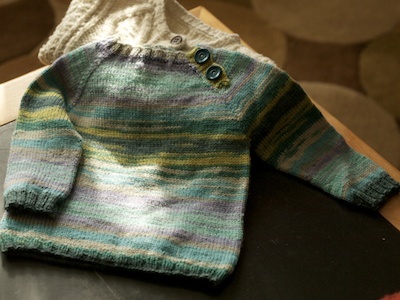 Since this yarn is self-striping, the width of the stripes is determined by the circumference of the knitting – and that means that the stripes would be skinny on the body, and then wider on the sleeves, and the thought of that gave me a wicked case of the heebie jeebies. 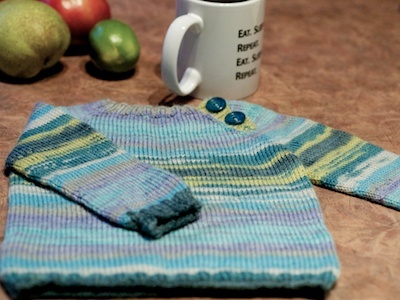 Instead, I knit on one sleeve until the stripe matched the stripe on the body, then broke the yarn and did the matching thing on the other sleeve – then discarded the rest of the yarn to get to the next colour, and repeated. I think it worked pretty well, but yeah. The sleeves had a LOT of ends to weave in. I know there’s lots of you who wouldn’t bother – and I salute you. Rock on. I’m going to knit. 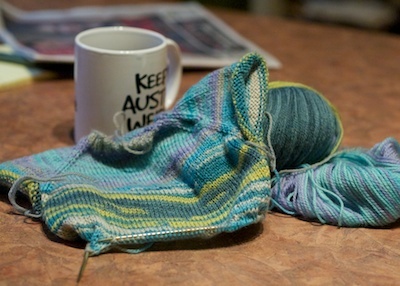 I’m going to hunker down with that cup of tea and that yarn right there and I’m going to knit a sweater. That’s two balls of Liberty Wool Light (unbelievably, they’re the same colourway) and it should be enough for a little pullover for a little person. It will be simple, and it will keep me from losing my mind, and by the time it’s done, maybe spring will be here. and he’s still wearing it, wearing it enough that Katie really would like it to have the button fixed, which is a good sign. This morning I pulled it out of my bag and had a good look. The sweater looks very, very different now. It’s clean, but has stains from when Lou scooched along, hiking himself forward on his forearms over floors and carpets like a little commando going under the fence. It’s a little pilled, from many, many washes, and the bib of the front is quite felted, from the wet of teething and the months of sliding himself along on his belly. 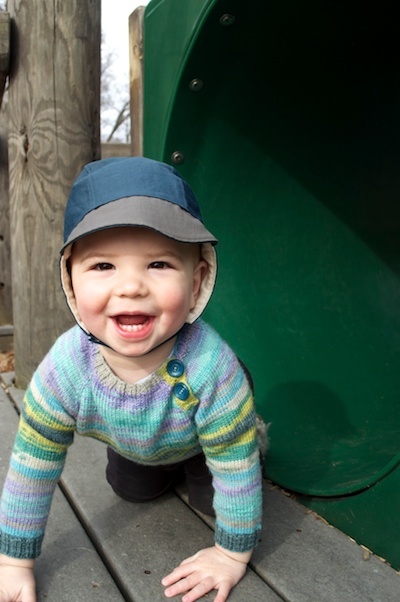 This sweater looks very, very used, and Katie said that the button broke while he was sliding through the big yellow tube at the park, and that means he was wearing it at the park. It’s quite the worse for wear. Every time I see Lou he’s wearing a handknit, and the way this sweater looks means that Katie isn’t just sliding him into one when she hears me come up over her front steps, like the way you get out the tablecloth your aunt gave you when she comes to visit. This sweater could only have gotten to look like this one way. Hard use. 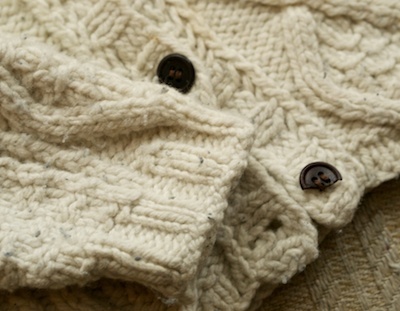 This sweater has obviously been played in, slept in, eaten in – and I’m so completely thrilled. 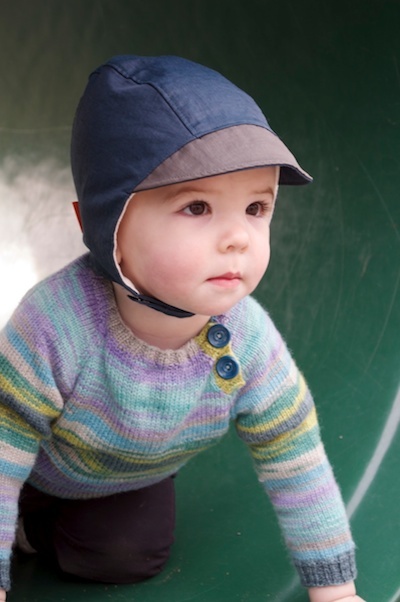 I would rather see a handknit I made a kid that looks like this than something tucked away and never used because it’s too precious. 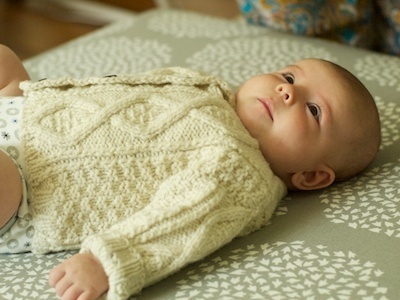 This is the exactly the role I want handknits to play in my family. Exactly this. 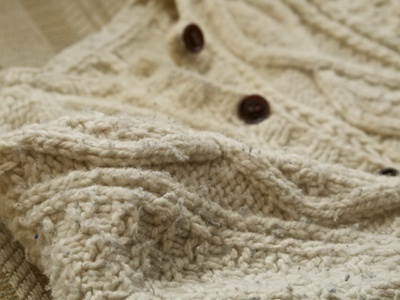 A comfy, soft, ratty sweater. I totally put a new button on. I hope he wears it to rags, and Katie, who helped this little sweater get like this? She can count on an endless supply.